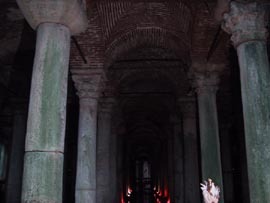 The Basilica Cistern and other cisterns like it (for example, the Cistern of 1,001 Columns) were built in the Byzantine era, many by Justinian I in the 6th Century. 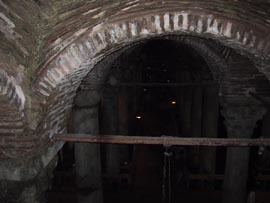 Virtually all water for the Byzantine city was supplied by these cisterns. 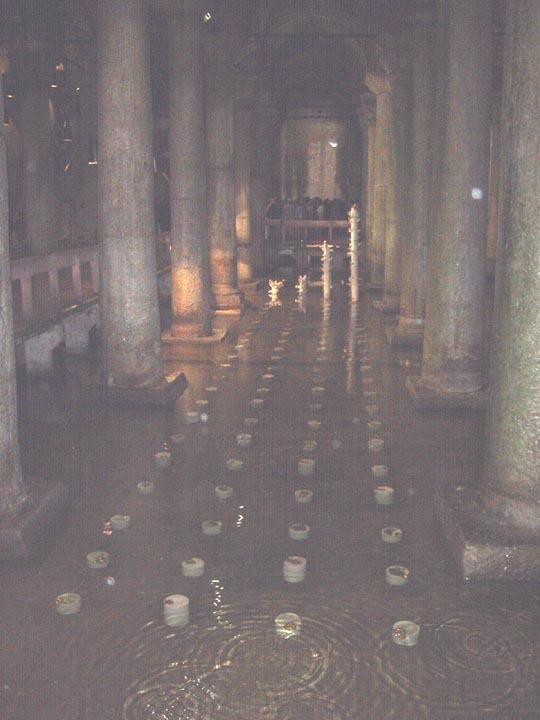 A stone walkway has been installed (it seems too modern and smooth to be original) to allow visitors to walk through the entire length of the vast chamber. 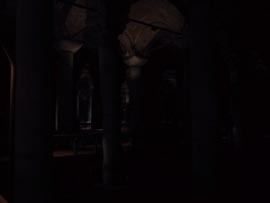 The Basilica Cistern today is virtually empty; only a couple of feet of water line the bottom. Full, the cistern must have held hundreds of thousands of gallons - the chambers are vast, tall and very dark. 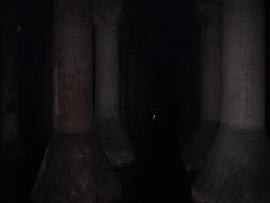  The camera flash was ill equipped to fill in the darkness between the many columns. From the stairway entering the cistern, looking down one of the main passages. 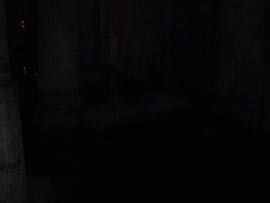 Also from the entrance stairway, this time looking toward the exit. Walking down the main walkway, looking up at the high ceiling between the columns. 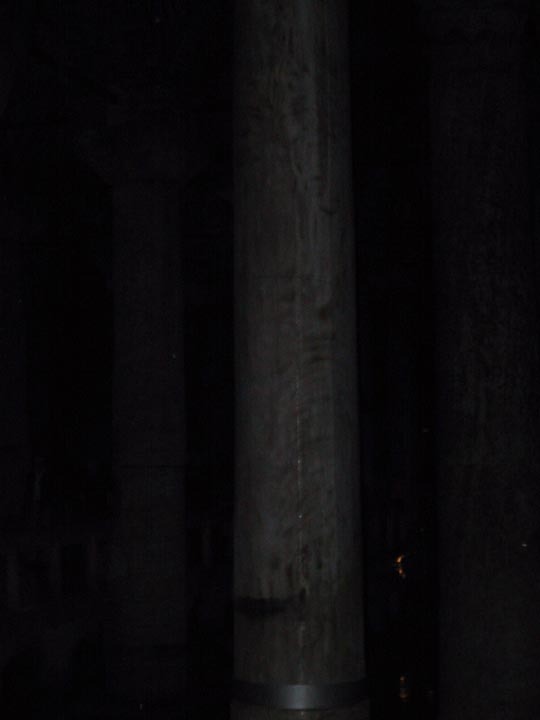 A peer through the gloom between the columns, you can faintly make out the far wall. 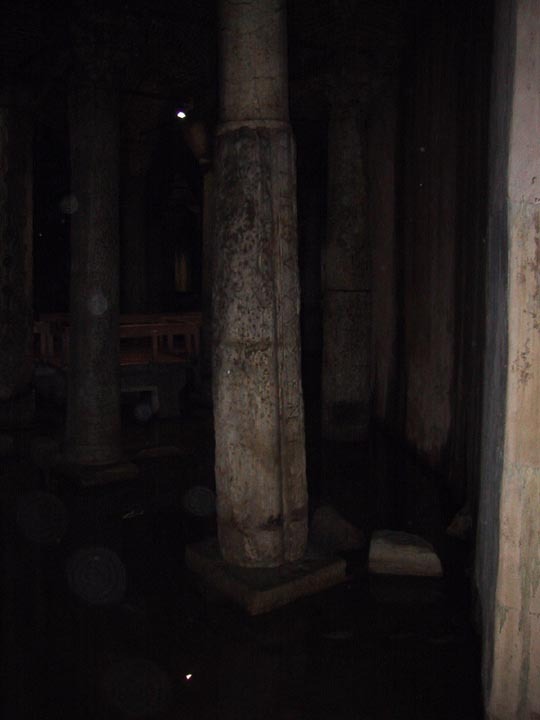 Near the center of the cistern is the so-called "Column of Tears." 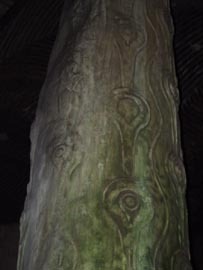 It is the only carved column in the cistern. Beside the Column of Tears we saw small fish swimming in the water - how they got in there and what they eat is a mystery. 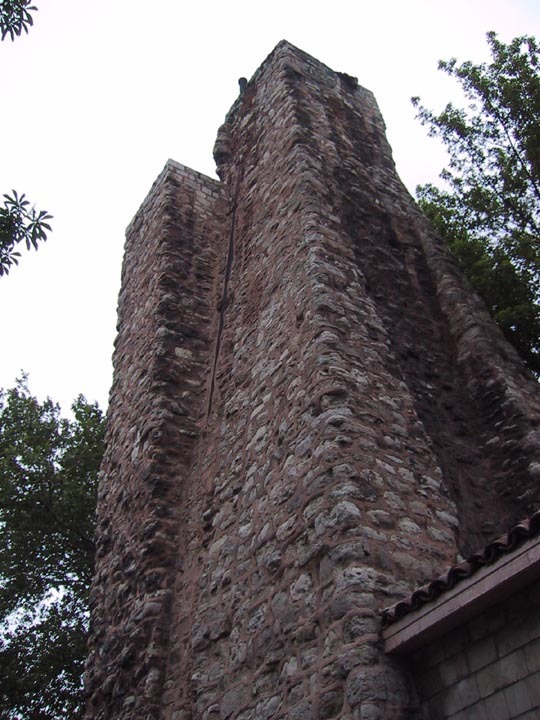 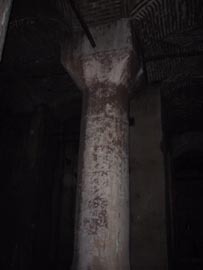 In among the ancient columns was a new cement column with steel strapping. And beside the replaced column was the remains of the old column. 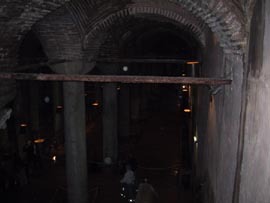 Toward the back of the cistern (after lots of walking) there is an alcove - the ceiling is full height, but the walls are closer. 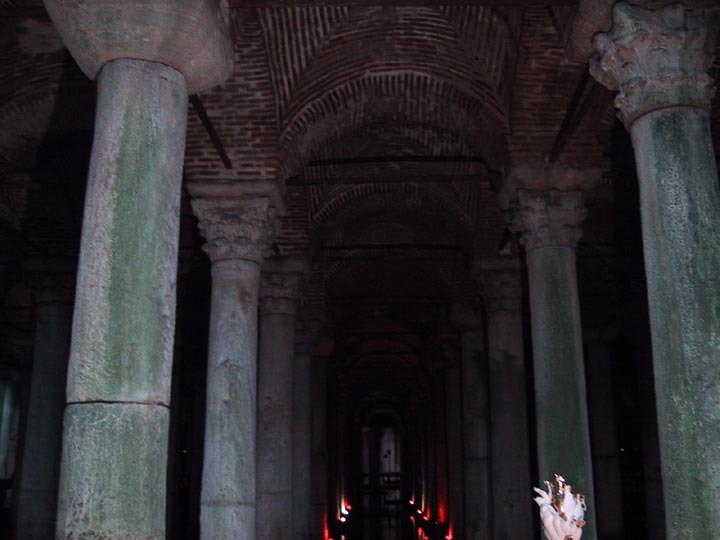 There's a theory that the Byzantine-era builders of the cistern wanted to build a shrine to the water nymphs for good luck. 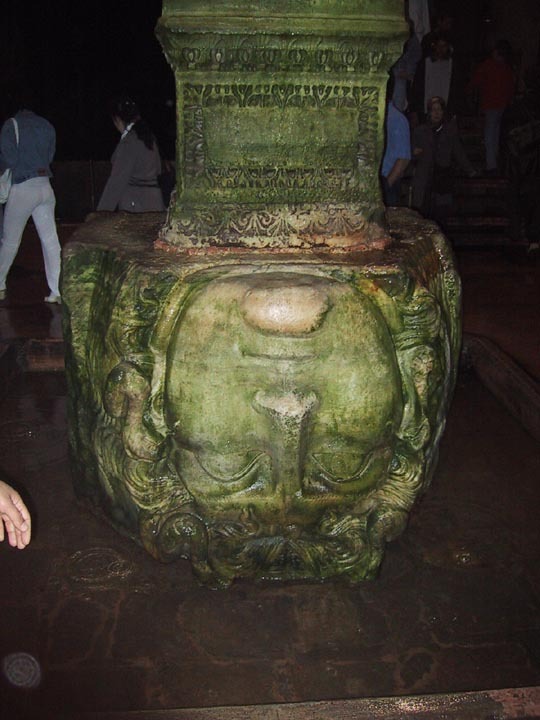 The only evidence of anything unusual are two column bases - each base has the face of a medusa on it.  Curiously, one is sideways and the other upside down. 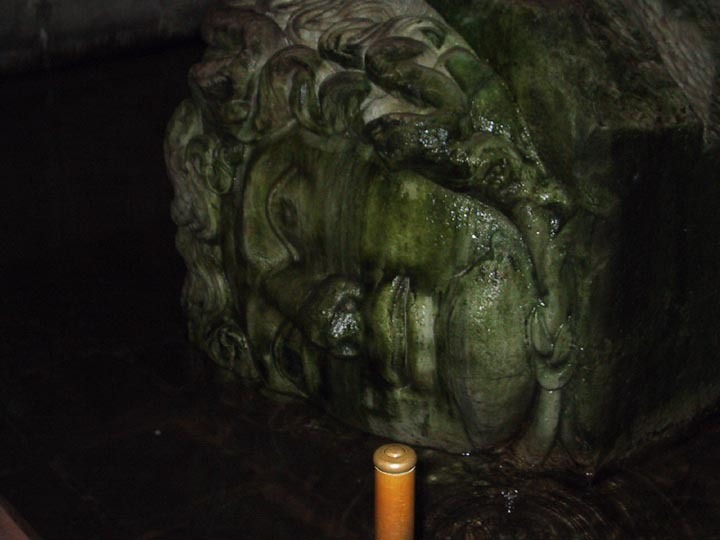 The presumption (according to literature in the cistern) is that these faces were part of another building before the cistern was built and were subsequently re-used in the construction of the cistern. 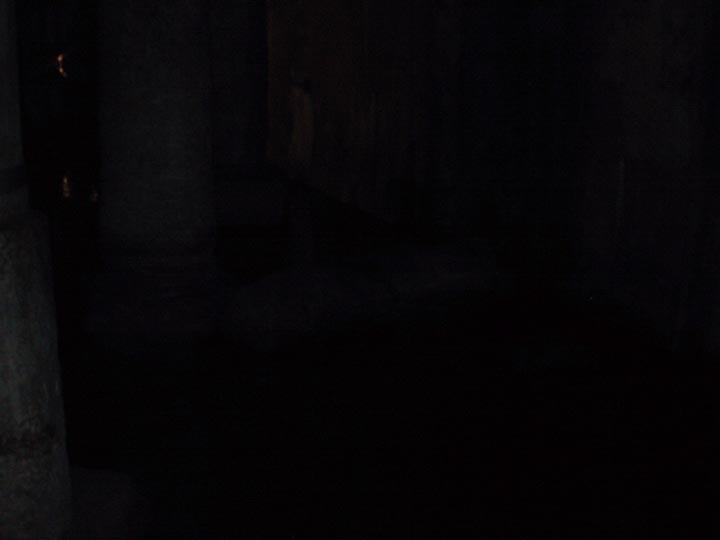 Recycling in the 6th century? 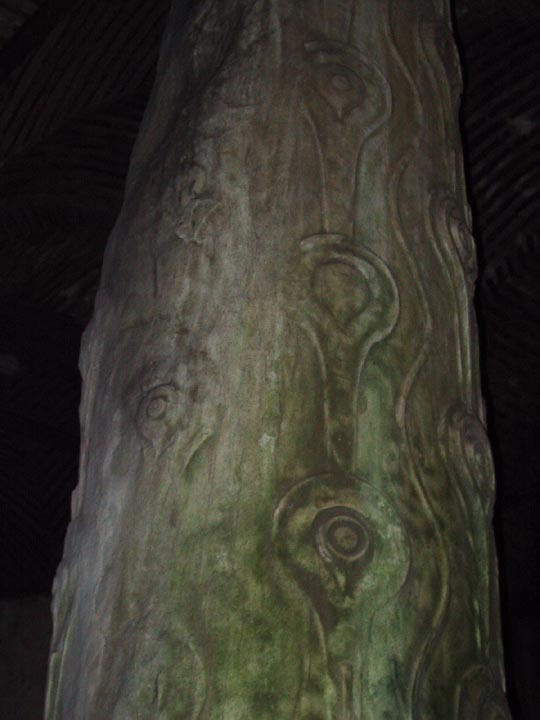 The sideways medusa head supporting a column in the back alcove. Above the sideways medusa head is a beautifully carved column foot, different from all the other columns in the cistern. 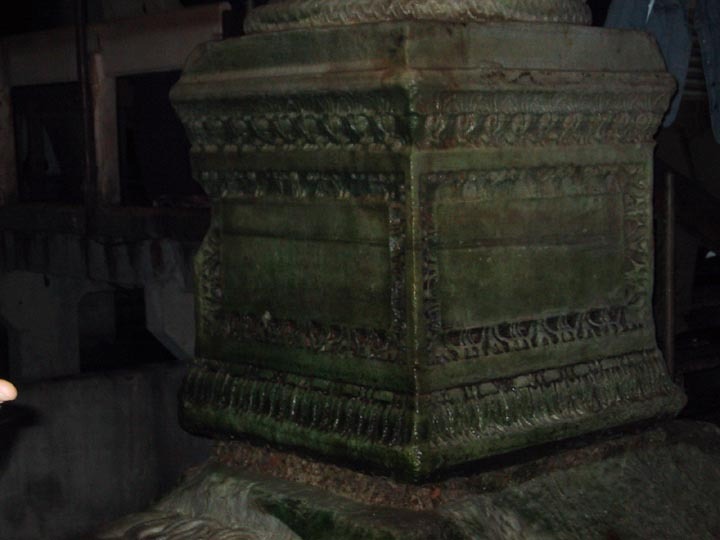 The next column over has an inverted medusa head and the same sort of carved column foot. A less than healthy looking column. 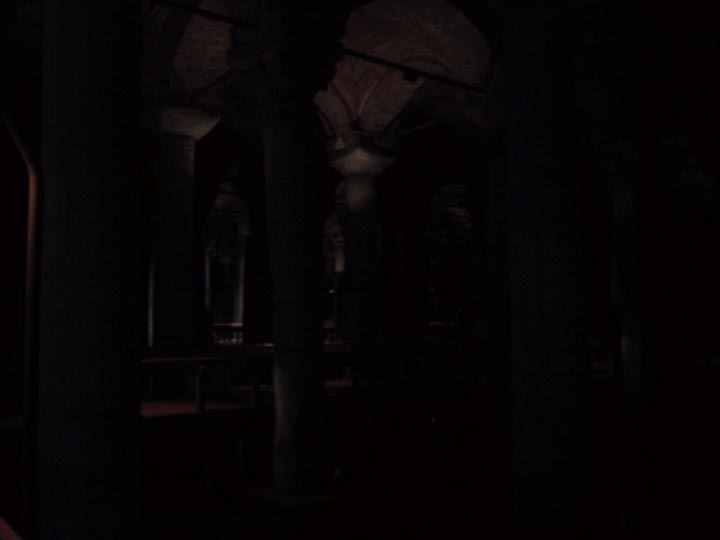 The cistern is beneath a developed city block of Istanbul, a collapse would be quite disastrous. What appears to be a modern concrete column, smooth with larger head and foot. 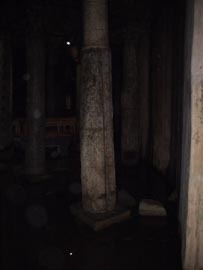 Further on we saw a large number of this bigger concrete columns, in some areas they were huge (20x20) blocks. Near the exit to the cistern, there is a line of art work of sorts, alabaster and gold columns. 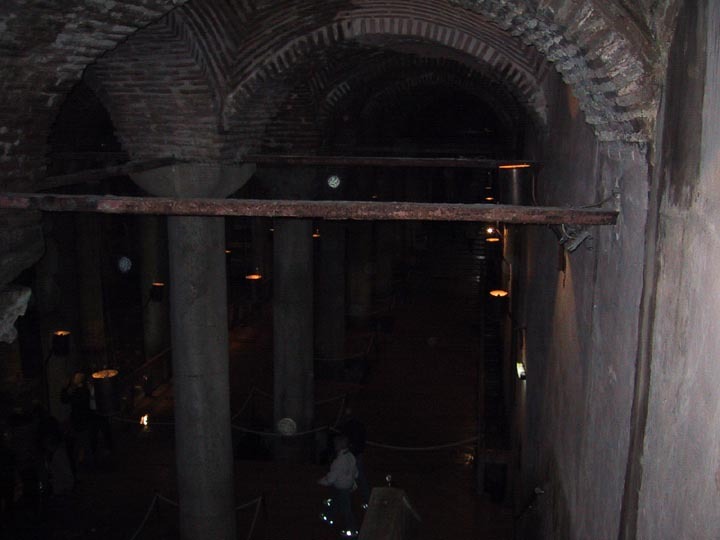 Outside the cistern was this tall structure, which in Byzantine times was part of the system for measuring the amount of water in the cistern.